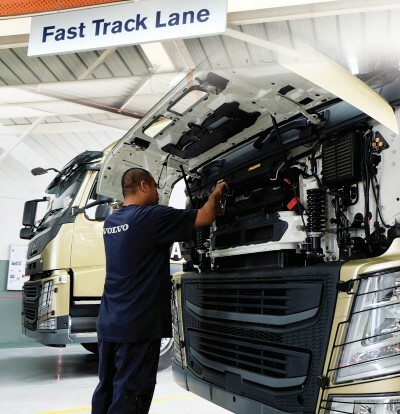 Aiming to further enhance its customer service, Volvo Trucks Malaysia (Volvo) launched the Fast Track Service facility at its flagship Shah Alam dealership yesterday. Designed to increase efficiency for its customers by enabling quicker turnaround in truck repair, this latest move by the global commercial vehicle manufacturer follows a string of dealership expansions and refurbishments under the company’s network development strategy aimed at amplifying customer benefits and expanding the value and experience of truck ownership for its customers. Volvo’s Fast Track Service comprises of four dedicated bays or fast track lanes which are specially designed and allocated to undertake minor repair work of trucks with a duration of two hours or less. Thus, customers with trucks that require minimal repair or service do not need to waste time waiting in line with other trucks that may need more complex diagnosing and longer repair time. A special Fast Track Service team comprising a group of technicians and service advisors has also been tasked to ensure that the customers’ truck issues are attended to promptly. The team will also see to an efficient scheduling of repair work, pre-diagnosing of problems, high quality repair and management of smooth operational work flow in all the four bays, all to reduce waiting time whilst keeping the regular bays available for trucks that need more attention and longer repair. The Fast Track Service bookings must be made at least 48 working hours in advance in order for the specialized team to pre-diagnose and prepare parts and tools for immediate repair of the affected trucks. “With a short and fixed time of maximum two hours to service or repair the trucks, our customers can plan their truck stops and driver roster more effectively as compared to them not knowing when their trucks will be ready to hit the roads again. And in that two hours, drivers can wait comfortably at our drivers’ lounge and enjoy some beverages there,” said Gunasekaran. “However, should unexpected problems be detected and which may require more than two hours’ of repair time, we will inform the respective customer and reallocate the repair work to the regular bay to avoid disruption to the Fast Track Service lanes,” Gunasekaran further added. The four-lane Fast Track Service facility can repair up to a maximum of 16 trucks per day. For urgent cases only, bookings may be accepted a day prior and work hours may be extended to accommodate more trucks. 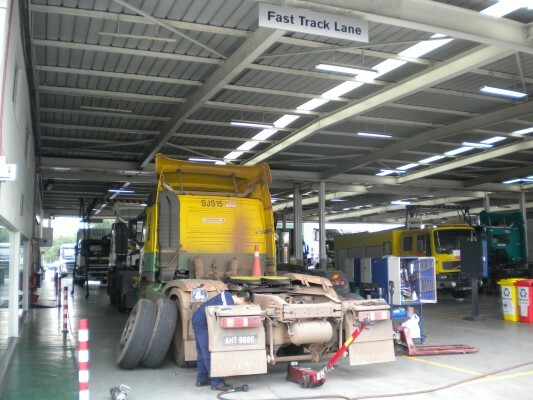 Other services complimenting the Fast Track Service include a brake testing facility located just next to the lanes. Customers are advised to make early booking by calling 1-300-808-108. Fast Track Service opens from Monday to Friday, 8.30am – 6.00pm (excluding public holidays) and accepts all Volvo truck models and variants. MAN is providing support for the complex logistics. Thirteen imposing TGX trucks will be transporting 65 tons of extensive stage equipment from performance to performance. Six of the trucks bear individual designs, these spectacular MAN Tattoo Trucks being the result of an international design competition. The aim was to creatively transform the lyrics from Maffay´s new album “Wenn das so ist” (“If that´s the case”) into shapes and color on a truck. Continental inaugurated a new 13,000 square meter facility to expand its R&D capabilities in Bangalore, India yesterday. With a total investment of 12.4 million Euro and a current headcount of around 1,000 engineers, the new Technical Center India (TCI) facility at Gold Hill Supreme, Electronic City Phase II will meet the increasing demand for engineering and software development skills to support global R&D projectsas well as local customers. Eight state-of-the-art R&D labs will be housed in the new facility. “With its access to qualified engineers and its high flexibility, Tech Center India delivers best quality and highly efficient engineering support to Continental globally. Setting up the TCI is an ideal situation for us and our customers. We are able to attract the huge talent pool in India to work on the latest technologies and innovations, while at the same time offering first-class services globally. For R&D activities, initially in software and algorithm development for advanced driver assistance systems, we hired 150 new engineers at the TCI last year”, said Frank Jourdan, President of the Chassis & Safety Division and Member of the Executive Board of Continental AG. Tech Center India is one of Continental’s three Automotive Systems and Technology (A S&T) hubs worldwide, providing high quality, cost effective, engineering solutions to Chassis & Safety projects from business units Vehicle Dynamics, Passive Safety & Sensorics and Advanced Driver Assistance Systems (ADAS), Interior projects from business unit Commercial Vehicles and Aftermarket, Body & Security and Powertrain projects from Engine Systems. 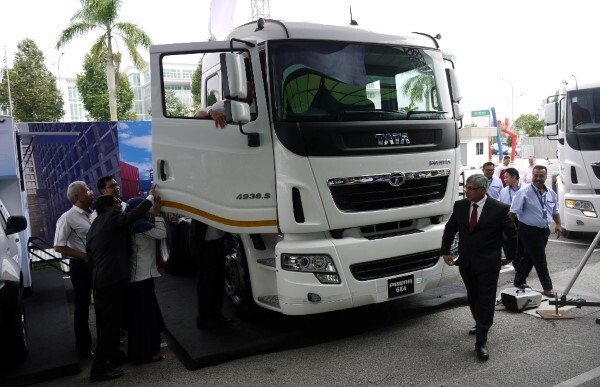 Two new commercial vehicles by Tata Motor Limited (Tata Motors) were launched yesterday by DRB-HICOM Commercial Vehicles Sdn Bhd (DHCV). This marks a significant milestone that further augments DRB-HICOM’s commitment to revive the Tata brand in the Malaysian market. 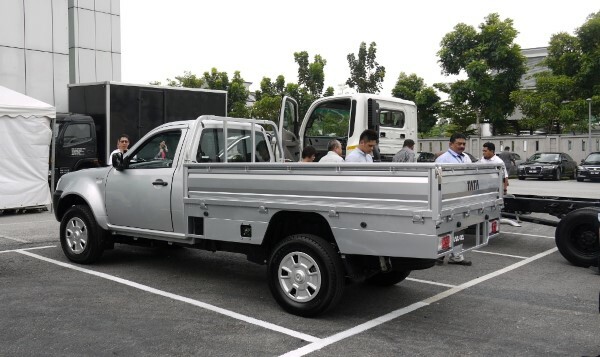 The wholly owned subsidiary of DRB-HICOM Berhad (DRB-HICOM) introduced the Tata Xenon Pick-up and theTata Prima Prime Mover, at EON Head Office Complex in Glenmarie, Shah Alam. The unveiling of the Tata Xenon Pick-up and the Tata Prima Prime Mover marked the re-emergence of Tata’s dynamic comeback to the Malaysia landscape since its first entry in 1993. There will be six variants of the Tata Xenon Pick-up, positioned as a workhorse for commercial applications for traders, small & medium industries and estate/plantation as well as for individuals with orchards or vegetable plots searching for a medium sized commercial vehicle to cart their harvest. Tata Xenon, being produced in Thailand, the International hub for pickups manufacturing for the global market, will be introduced in CBU form with a New Generation 2.2 litre Common Rail Turbo Diesel engine, producing 140 PS. The Tata Prima Prime Mover comes with a 4×2 and a 6×4 configuration – Tata Prima 4038.S and Tata Prima 4938.S. The Tata Prima is a new generation of Medium and Heavy Commercial Vehicles from Tata Motors conceptualized, designed and developed as a Global Truck. Setting new benchmarks in styling and features, the next-generation Tata Prima is a combination of power, world-class performance, fuel efficiency, superior technology and safety. The Tata Prima has been built with technical inputs from across the world – an Italian cab design, engine technology from the USA and Europe, gearbox expertise from Germany, chassis frame know-how from Mexico, sheet metal dies from Japan and Korea, combined with Swedish precision on a robotic weld line, hence is also referred to as the ‘World truck’ by Tata Motors. 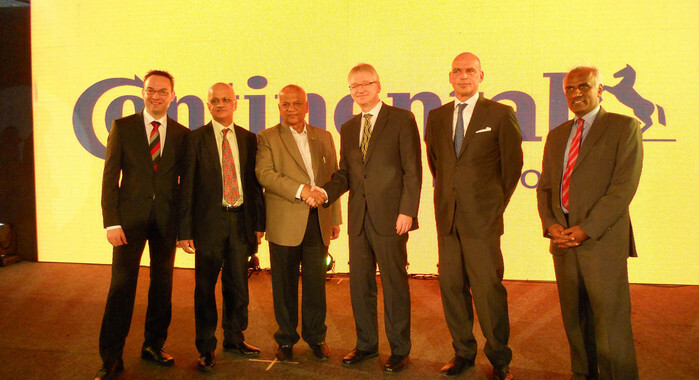 The Tata Prima is targeted for fleet owners, distribution and logistics companies. He said this amplifies Tata Motors trust in DRB-HICOM’s commitment to not only reintroduce Tata vehicles as the preferred vehicle for commercial use in the local market, but its ability to spur Tata’s market presence and growth of the TATA brand in Malaysia. 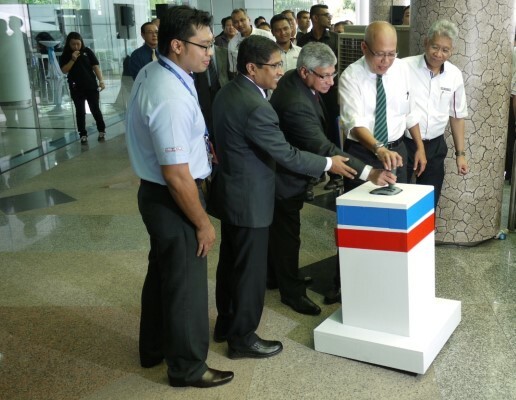 Tan Sri Dato’ Sri Haji Mohd Khamil added the Tata vehicles will be assembled locally. He said that the CKD assembly operation will be carried out by HICOM Automotive Manufacturers (Malaysia) Sdn Bhd (HAMM) in Pekan. “A fresh investment of RM10 million will be injected to establish DHCV’s operation, including the new sales branch, distribution and after sales related activities. The establishment of a reliable after sales support is one of the key elements in providing the best customer experience for the Tata vehicle user,” said Tan Sri Dato’ Sri Haji Mohd Khamil. A 3S (Sales, Service and Spare parts) centre has also been established in Selayang to facilitate the after- sales support and needs of Tata vehicle owners in the Klang Valley and neighbouring areas. The 3S facility has a total of 12 service bays to provide service, after-sales and spare parts under one roof for the convenience of Tata customers. Volvo Trucks has received Europe’s Quality Innovation of the Year Award for the second year running. The award was given for Volvo Trucks’ new transmission, the I-Shift Dual Clutch. 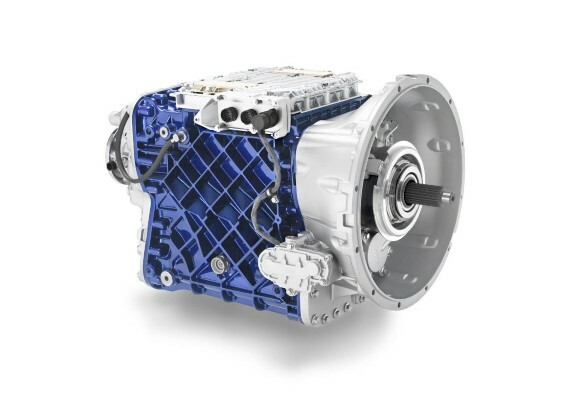 The I-Shift Dual Clutch is an automated manual gearbox with dual clutches. With this solution, the truck does not lose either speed or power during gear changes, instead providing efficient and smooth progress on the road. This type of transmission was initially developed for high-performance sports cars and is used in the automobile industry. Volvo Trucks is the first company in the world to employ the technology in heavy vehicles. “I-Shift Dual Clutch represents a new-for-the-industry product innovation with strong improvements in parameters that influence drivers and transport companies as well as cargo owners and society in general,” says Matti Kaulio, Associate Professor Industrial Economics, KTH Royal Institute of Technology in Stockholm and representative of the Swedish SIQ (Swedish Institute for Quality). Associate Professor Kaulio sits on the panel of experts that selected this year’s award-winner. The Quality Innovation of the Year Award is backed not only by SIQ but also by quality institutes in several other European countries. The 2014 awards is presented by Hungary’s President János Áder at a ceremony in Budapest on January 19. In 2013 Volvo Trucks received the Quality Innovation of the Year Award for Volvo Dynamic Steering, a steering stabilisation system that has attracted considerable worldwide attention not least thanks to the film “The Epic Split” starring Jean-Claude Van Damme. 2014 was a record year for the Jeep brand, both in terms of sales and for the initiatives and events supporting the commercial launches of new models in Europe, the Middle East and Africa. The number of Jeep registrations in 2014 was unprecedented, increasing by more than 42% in EMEA and by 70% in Europe (EU-28 + EFTA), with record results in many of the main countries, notably France with a surge of 110%, followed by Italy with 95%, Belgium with 87% and the UK, which was up by 75%, and finally Germany, which recorded increases of 51%. December represented the 14th month of consecutive year to year growth, both on a regional level and in many of the main countries (Russia, Italy, Germany, France, Belgium and Switzerland, just to name a few). 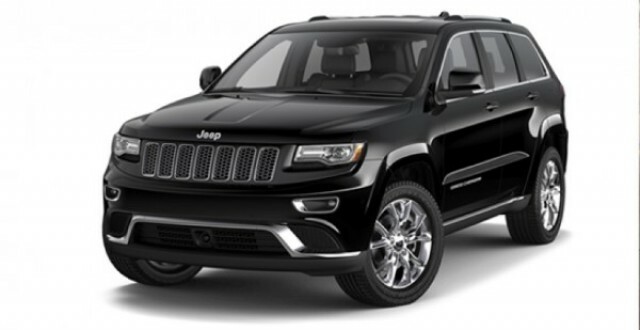 Looking at the product, Jeep’s success was driven by the performance of the flagship Grand Cherokee, which remained in the top positions in terms of sales throughout 2014 both in Europe as a whole, where it climbed by 3 positions compared to 2013, and in some of the main European countries, including Germany. In Italy, the Grand Cherokee occupied the top position in its segment for 5 months out of 12, including December, ending the year in second place overall. In addition, the Grand Cherokee was the second highest selling vehicle in its segment in Switzerland and Poland. The first new entry to the Jeep family in 2014, the new Cherokee presented at the 2014 Geneva motor show, recorded its highest sales since 2008, allowing Jeep to double its sales in this segment and exceeding monthly registrations of the previous generation on an annual basis. The new Cherokee received multiple awards, among them the “Best Small SUV” awarded by the Car Of The Year Awards 2014 in the Middle East, and the recognition as the “SUV of the Year” by the Association of Scottish Motoring Writers. Sales of the new Renegade – the latest addition to the Jeep family, which marks the brand’s entrance in the compact SUV segment – started at the end of September in Italy and in October in the other main European countries. The Jeep Renegade immediately entered the list of the top ten best selling cars in Italy in its category and reached the top position in its segment in December. The first Jeep Renegades destined for non-European markets (mainly North America) are being shipped in January. First from Southampton and Antwerp then from Salerno and Civitavecchia, the ships will sail to different destinations, with volumes that vary from 300 to 500 units for the smaller ships to almost 3,000 units for larger ships, with a sailing time that can vary between 2 and 3 weeks. 2014 also saw the début of the Jeep® Owners Group (JOG), the only official group managed centrally by the brand. It is already active in 9 European countries. JOG is the “place” where the brand meets its Jeepers, the vehicles’ owners and fans of the brand, and is integrated with the existing national clubs. The Jeep® Owners Group is also active in the main social networks, using dedicated channels that provide users information and enable them to interact with other community members as true ambassadors of the brand around the world. Hino held an event to announce the launch of its new medium-duty truck model in Indonesia. Hino has been engaged in developing “market best-fit vehicles” based on modular designs, and the model introduced in Indonesia represents the first iteration of such products. This is the first time Hino will be launching the production of a new model outside of Japan. Hino’s customers in Indonesia have utilized Hino trucks and buses for over three decades. Sales of the light-duty “market best-fit vehicle” truck, introduced in 2010, has grown steadily to the point where the sales volume of Hino vehicles overall is now second only to that in Japan. This makeover of our flagship model in the medium-duty trucks category enables us to offer vehicles that accommodate a variety of different applications and types of cargo in the medium-duty category. Also, in conjunction with enhancements to our Total Support, we are committed to our ongoing efforts to maximize our customers’ up-times, and minimize their life cycle costs. The development of market best-fit vehicles based on modular designs was one of the initiatives driving our growth strategy which was included in the mid-term corporate plan announced in April 2012. 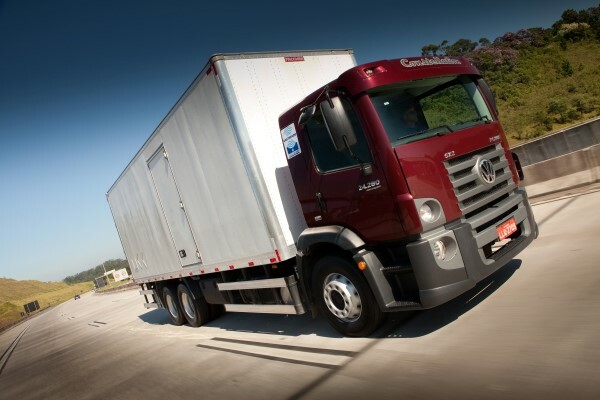 Commercial vehicles represent capital assets that our customers use for their business operations. And because there is great diversity in the types of cargo as well as the applications that need to be addressed in the commercial vehicles market, this results in high-mix low-volume production, where the number of models continues to grow as the number of units per model remains small. In addition, the kinds of parts tend to increase with the number of models. In response to these issues, Hino introduced the modular concept in its development process, where parts and components are categorized as either core parts, which form the foundations of a model, or peripheral parts which are used for making customizations to vehicles based on customer requests. According to Hino, they have gained the ability to produce a diverse range of vehicles in locales that are geographically nearer to their ultimate market destinations, by designing core parts in Japan while increasing the number of locally sourced parts. The company also said that over the next few years, it will be following the precedent set by its initiatives in Indonesia to expand the range of regions and markets where we are able to provide these new modular models as “best-fit vehicles” for other regions and markets. 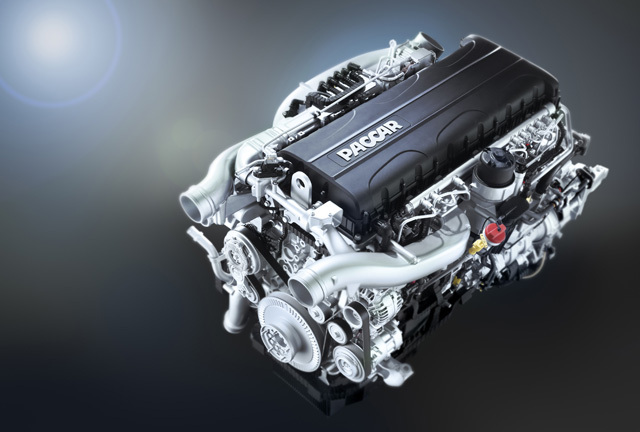 In order to further increase efficiency, DAF’s PACCAR MX-11 and MX-13 engines have been optimised. With an already excellent reputation for fuel efficiency, the PACCAR MX-11 and MX-13 engines are now up to 2 per cent more economical, of course depending on application and conditions. Multi-pulse injection also means that the engines run even more quietly than before. The PACCAR MX-13 engine optimizations not only improve fuel efficiency, they also have a positive influence on the performance of the engine brake. With a 20 per cent increase in power, the engine brake is an excellent alternative to a retarder for the majority of applications. The MX Engine Brake – which can now be controlled from the steering column in three stages – offers significant cost, weight and fuel consumption benefits. Eco Mode is a new standard feature on all Euro 6 CF and XF models with PACCAR MX engine. Eco Mode reduces engine torque by 10% in the first eleven gears, again reducing fuel consumption in daily use by approximately 1%. Most driving conditions don’t require full acceleration, and maximum torque can easily be made available at the touch of a button. Predictive Cruise Control is a great example of the DAF Transport Efficiency philosophy. This option is available – combined with Predictive Shifting – on the Euro 6 CF and XF. Both sophisticated technologies have been developed by DAF’s engineering team and contribute to enhanced vehicle efficiency. Predictive Cruise Control uses advanced GPS-technology to determine the exact position of the vehicle and to know which driving conditions have to be taken account of over the next 1 to 2 kilometres. In fact, the system ‘looks’ ahead and anticipates slopes and descents. Within the specified range, Predictive Cruise Control determines the ideal speed and Predictive Shifting selects the ideal gear. Thanks to these features, fuel consumption and CO2 emissions can be reduced by as much as 3 per cent, specifically over hilly routes. 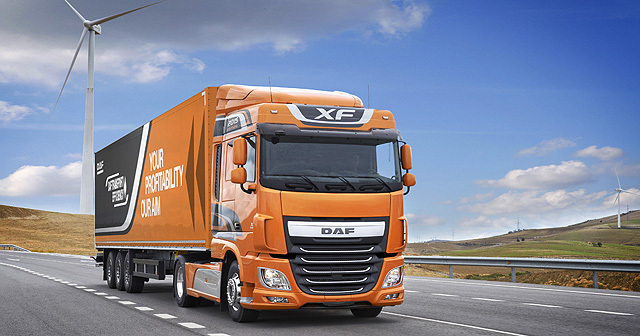 That said, all product innovations for 2015 are part of DAF’s Transport Efficiency programme aimed at further increasing truck efficiency through lower operational costs and maximum vehicle availability. The many services behind the product play an important role in achieving this. PACCAR Parts ensures first class parts supply, while DAF’s unrivalled International Truck Service (ITS) guarantees maximum uptime. PACCAR Financial Services offers attractive financing solutions for low operational costs. MultiSupport Repair and Maintenance contracts include the option of Uptime Plus with additional services and features to optimise revenues. This is a great example of how the DAF Transport Efficiency programme not only includes the most efficient trucks, but also represents a full range of services to maximise the profitability of the transport operator. Three of MAN Latin America’s truck models also appear in the list of top ten selling trucks in Brazil. With 7,673 licensed units, the VW Constellation 24.280 6×2 model defended the top spot. The vehicle is equipped with an engine effectively boasting 275 horsepower, features cost-saving EGR emission technology, and is suitable for short, medium, and long routes. 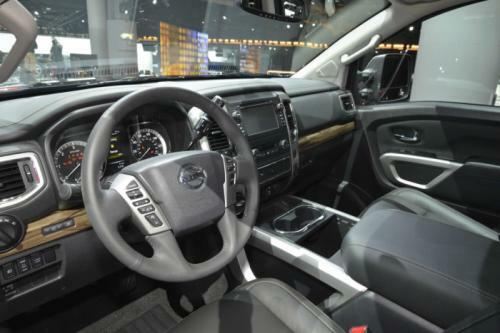 Nissan today debuted the all-new Nissan Titan full-size pickup to a standing room-only crowd of international media at the 2015 North American International Auto Show. 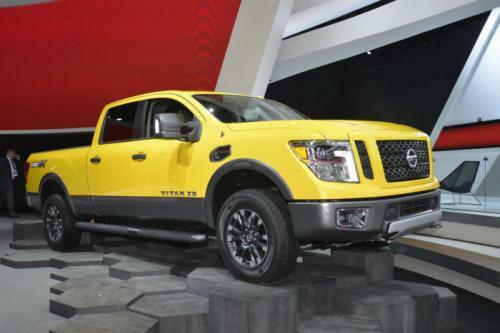 The new Titan XD, the first of the new generation of Nissan Titan models, creates a new segment of the American market. It offers the effortless towing and hauling of the larger, more expensive heavy-duty trucks – yet has the fuel-efficiency and affordability of half-ton pickups. It is projected to go on sale at Nissan dealers nationwide in late 2015. Additional available Titan XD utility features and convenience aids include RearView Monitor with Trailer Guides, Around View® Monitor (AVM) with Moving Object Detection (MOD) and a Trailer Light Check system that allows one-person hook-up operation – including checking turn signals, brake lights and running/clearance lights from outside the vehicle. Also available are Blind Spot Warning (BSW) and a Front and Rear Sonar System. According to Nissan U.S, engine choices for the pick up include an all-new V8 petrol engine, as well as a V6 mill. 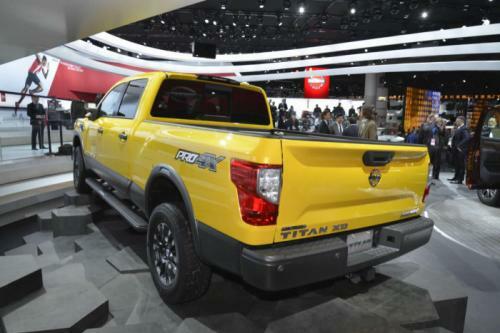 The all-new Titan, like the first-generation model, was developed with core Nissan planning, design, engineering and manufacturing teams contributing from Tennessee, California, Michigan, Arizona and Mississippi. Although the model will not be available here in Malaysia, we can expect future Nissan pick up models that will be sold here to adopt maybe a few design cues or features from the Titan.